Going to a State of the Union watch party may sound like a strange idea to people outside the D.C. area, but it’s a long-held tradition for residents of the nation's capital. The most creative drink menu goes to this Capitol Hill hotspot. 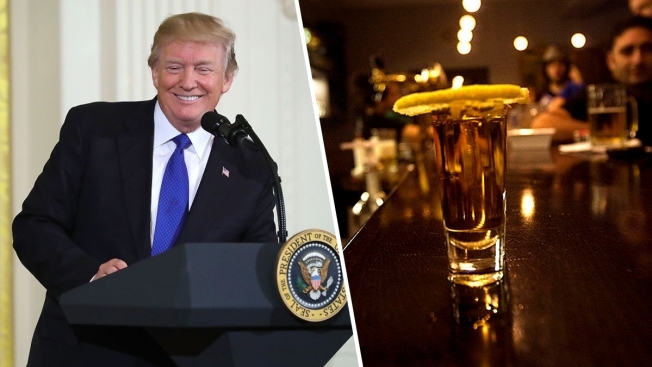 For $5 each, pick up a “Fake Moscow Mule”, the “Most Tremendous Daiquiri,” “Covfefe 75” and “Stable Genius Shots” with Fireball. Ventnor will host its 13th Annual SOTU Watch Event. This year, the two-story Adams Morgan establishment will donate 10 percent of the proceeds to Ayuda, an organization offering legal and social services to local immigrants. Fifteen screens will broadcast the address at the pub on Vermont Avenue. They will have drink specials all night, bingo and a “Covfefe Cocktail” with no cover charge. The popular nightspot on U Street will have $15 buckets of Budweiser products all night in honor of the speech. Barrel is offering free shots of Old Overholt whiskey in its Elixir Bar for every time Trump says "fake news" during his speech. The Elixir Bar will also offer $5 draft and canned beers starting at 8 p.m. This bar has a $1 “cheap shot” available for every time Trump insults someone. In addition to early drink specials and prizes, Satellite Room is promoting a bingo game including squares that say "Fake News" and "HUUUGE" as "a game fitting for the occasion." Union Pub's watch party also features Trump bingo with drink prizes for winners. Their specials start after 5 p.m. and include $4 select bourbons, $5 rails and $12.50 Bud Light Pitchers. This U Street bar will provide a raffle grand prize as well as $5 beer, wine, rail drink, and appetizer specials after 6:30 p.m. According to the Facebook event, the viewing party will be hosted by a political group called Network for Progress.